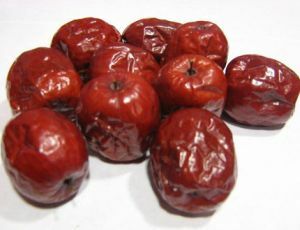 Ziziphus mauritiana, also known as Ber, Chinee Apple, Jujube, Indian plum and Masau is a tropical fruit tree species belonging to the family Rhamnaceae. Z. mauritiana is a spiny, evergreen shrub or small tree up to 15 m high, with trunk 40 cm or more in diameter; spreading crown; stipular spines and many drooping branches. The fruit is of variable shape and size. It can be oval, obovate, oblong or round, and that can be 1-2.5 in (2.5-6.25 cm) long, depending on the variety. The flesh is white and crisp. When slightly underipe, this fruit is a bit juicy and has a pleasant aroma. The fruit's skin is smooth, glossy, thin but tight. The species is believed to have originated in Indo-Malaysian region of South-East Asia. It is now widely naturalised throughout the Old World tropics from Southern Africa through the Middle East to the Indian Subcontinent and China, Indomalaya, and into Australasia and the Pacific Islands. It can form dense stands and become invasive in some areas, including Fiji and Australia and has become a serious environmental weed in Northern Australia. It is a fast growing tree with a medium lifespan, that can quickly reach up to 10–40 ft tall. The fruit has been used in traditional medicine as an emollient, expectorant, coolant, anodyne and tonic and has been used as an antidote for aconite poisoning. It is given to relieve abdominal pains during pregnancy and can be applied to wounds when used in a poultice. The leaves can be used as a laxative and for throat problems as a decoction and the same liquid can also be used for skin problems. The roots have wound healing properties too. Medical researchers have found a “new” flavonoid in ber called zivulgarin and trials are underway to discover how it might benefit us. Oleamide found in an extract of Zizyphus jujube has been found to help fight Alzheimer’s disease, and help the cognitive processes. Wood from the trees is used by villagers to make agricultural implements as it is hard and durable, while the leaves are used as fodder for sheep and goats, so all parts of the tree are useful and well utilized. It has been found that there is saponins in he leaves and vitamin C in the form of ascorbic acid in the fruit, as well as the B-complex vitamins, thiamin, riboflavin and pectin. It has immunostimulant, antioxidant and wound healing properties, and pectin is known to be useful in cases of diarrhoea. The fruit also helps lower cholesterol levels and blood pressure. Some of the triterpenoic acids isolated from the fruit are also believed to be useful in fighting cancer and HIV.